The intriguing illumination in this manuscript provides a fascinating insight on noble history and social practices in early 14th-century England : it concerns marriage, expectations, dynastic wishes, clinging to property, and mocking iconography. English Books of Hours are extremely rare, especially in comparison with the number of prayer books produced in France at the same time. The Beauchamp-Corbet Hours is one of the few early 14th-century Book of Hours still in private hands and is a book that has a story to tell! 165 x 110 mm. – 195 leaves. With 39 historiated initials and most pages with border decoration, including 15 coats of arms. Decorated on nearly every page with a multitude of striking small miniatures, historiated initials, and bas-de-page scenes, the surprising illumination in the present prayer book includes animals, fabulous creatures, wild men, and other figures and presents a wealth of different coats-of-arms. The manuscript was a wedding present for Beatrice Beauchamp (and widow Corbet, d. 1347) and gives visual expression to the Beauchamp-Corbet family connections, made to remind Beatrice to honour and not to forget her extended family. In the Beauchamp-Corbet Hours, dated 1328, heraldry is one of its most striking elements, enabling us to pinpoint the original owner as well as the donors who commissioned the manuscript. Four of the historiated initials include figures dressed in a heraldic surcoat, and 15 shields appear in the borders, representing the coats-of-arms of 8 families. At the Penitential Psalms, a lady is depicted who receives absolution from her Dominican confessor: here, Beatrice Beauchamp is identified by way of her dress with the arms of the Corbet family. Another initial shows three standing, veiled women with hands clasped in prayer while receiving the blessing of the Dove of the Holy Spirit. The coats-of-arms show that the central woman is Beatrice while the two women accompanying her wear the arms of the Fitzalan earls of Arundel. This clearly suggests a blood relation between the ladies. In all, the illumination bears testimony to 8 noble families related to Shropshire county and its neighbouring regions, such as the Beauchamp of Hache, Corbet, Leyburn, Fitzalan, Fitzwaren, Warenne, Lestrange of Knockyn, and Leigh or Lye. Made on the occasion of her second marriage to John Leyburn of Great Berwick, Shropshire, the widow Beatrice Beauchamp (d. 1347), daughter of John Beauchamp of Hatch (Somerset), was about to leave (c. 1329) the family of her first husband, Piers II Corbet (d. 1322) of Caws Castle. The arrangements of that first marriage were thus that the widow would gain sole possession of the Corbet barony on her husband’s death – with the serious risk that the Corbets would lose their ancestral property when the new marriage of Beatrice and John Leyburn would be blessed with children. Beatrice’s second husband had inherited from the Lestrange family, and he now became lord of Caws in right of his wife. Because the Corbet shields and women dressed in the Corbet arms are so prominently depicted, this suggests that the female relations – likely Piers Corbet’s aunts, Alice and Emma Corbet – ordered the manuscript as a gift to maintain the bond with the widow Beatrice upon her remarriage, wishing to remain ‘in the picture’, so to speak. Not all of the scenes in the book are so serious. At the opening of the Office of the Dead within the initial D (ilexi quoniam exaudiet dominus, I have loved, because the Lord will hear the voice of my prayer, Ps. 114), the hollow of the letter shows a fox holding a book. He presides over the funeral of another fox; whose body lies covered by a shroud on a bier while two hares and two wolves function as pallbearers. A dog, a rabbit, and a stag have joined the procession. This scene seems to refer to the mock-funeral of Renart the Fox as it is told in the Roman de Renart. Such mocking images must have had a wider appeal beyond amusement: the contrast between the real and fabulist world (as Renart faked his death) reminds the reader of the importance of sincere devotion. In the lower margin, two wild men hold the arms of the Leyburn family. Four artists collaborated in the illumination of this manuscript: the first artist was responsible for the illumination of the calendar, the historiated initials, miniatures in the margins up to f. 40v, and all of the illuminations on ff. 119r-192v. The second illuminator was responsible for all miniatures on ff. 41r-91r, and ff. 105-116r. The work was further distributed among two more artists. They are all associated with the so-called Milemete Group who were active in London in the 1320s and named after the Treatise by Walter of Milemete that was written for the young King Edward III (c. 1325, Oxford, Christ Church College, Ms. 92). It is not fully clear whether the original donors succeeded in their intent, but the manuscript was handed down within the related family. 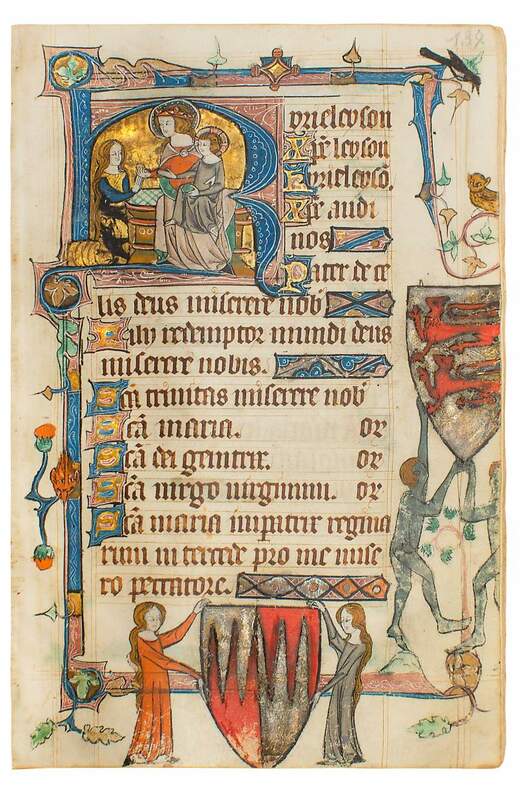 At the end of the 14th century, the Book of Hours was in the possession of the Willoughby family of Lincolnshire. Various obituary notes were added concerning family members related to Lestrange and Fitzalan as mentioned above. This book most certainly has more than one story to tell!